In their drive to earn extra money, Sam and Susen Meteer divide the night and day between them. At any hour on the clock, one or the other is probably driving. It’s how the Meteers make ends meet. This married couple has five children, four living at home in Sacramento, California. Sam is an elementary school teacher by day who gets behind the wheel on nights and weekends. Susen is a full-time mom to their kids — ages 9, 11, 13 and 15 — with the couple’s oldest child now married and out of the house. On weekday mornings, Susen drops her kids at school and keeps on driving. That’s how they tag-team it — they both drive with Lyft. The ride-sharing company’s flexible hours allow them to raise their children while also earning enough to support them. The couple drives whenever they can, within reason. He earns anywhere from $300 to $1,000 a week through Lyft, depending on how much he drives. That top range — $1,000 a week — is rare for him and he only hits that during times like the Christmas holidays, when school’s out and he’s not teaching. Otherwise, he’s usually driving 20 to 30 hours a week. As for Susen, once she drops her kids at school and starts driving for Lyft, she sets herself a simple goal: Earn $100 that day. If she works consistently, she can bring in $500 a week that way. “It keeps milk on the table,” Sam says. Together, they can pull in $800 to $1,500 a week, although that top end is rare. How much do Lyft drivers typically make? Earnings are largely based on how much they work and how they manage their time. Drivers who post screencaps of their earnings online often show they’re earning $18 to $40 per hour, with many earning around $25 per hour. For example, this guy who lost his job now earns about $750 driving 45 to 50 hours a week with Lyft in Philadelphia. Sam, 47, had always waited tables to supplement his teaching salary. He did that for 15 years and got awfully tired of it. He was ready for a change. But it was Susen, 43, who first discovered Lyft. She downloaded and used the app while out with friends one weekend. Then she started experimenting with driving for Lyft when the kids were at school. Before long, Sam got jealous of his wife’s sweet Lyft gig. He quit his restaurant job and joined her. Lyft is expanding like crazy this year to compete with its rival, Uber. It’s looking for drivers in 100 more cities. Expansion areas include the Southwest, the Southeast, the Carolinas, the Rockies, the Midwest, New England and Central California. If you’re curious to see what you’d make, Lyft has an earnings calculator. Type in how many hours you’d want to work and your city. Here’s what you should know before driving for Lyft or Uber. 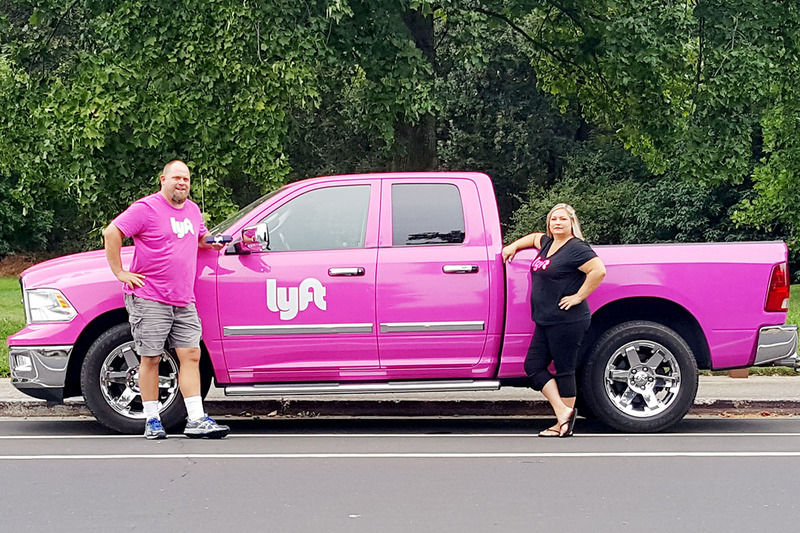 Today the Meteers switch off Lyft shifts in their 2012 Honda Odyssey van and their 2011 Dodge Ram Laramie truck, bright pink with a Lyft emblem painted on the side. Splitting up the day and night between them, they drive for different crowds. During the daylight hours, Susen gets the buttoned-up business crowd mixed with a few college students. She keeps the van spotless. The whole thing is low-stress. “Pretty much everyone is pretty cool,” she says. Sam gets the night crowd. The party crowd. The bar crowd. “People who have been out having a good time,” he says cheerfully. These passengers can be pretty boisterous. Sam keeps water bottles and has cleaned up a couple of messes, but hasn’t had to deal with any uncomfortable incidents. “I try to be as friendly as possible,” he said. Friends always ask the couple, What was your wildest ride? What was your worst ride? But in two years, the Meteers have yet to have an unpleasant experience driving with Lyft. Right now, Lyft is offering a $300 sign-on bonus to new drivers when you use code EXTRA300. Mike Brassfield ([email protected]) is a senior writer at The Penny Hoarder. He could use a lift, thanks for asking.